PHYTOMER Soothing skin care supports the defenses of sensitive skin and effectively diminishes the feeling of burning and tightness. Their natural active ingredients work in harmony with the skin for less visible redness and excellent tolerance. 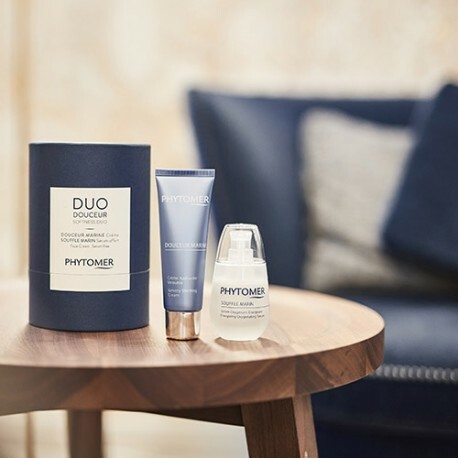 PHYTOMER soothing day creams, formulated for optimal tolerance, are effective against redness and burning, and improve the defenses of sensitive, reaction-prone skin against everyday aggressors. Supplement your soothing beauty routine with an additional skin care to relieve the discomfort of sensitive skin with extreme gentleness. This cream mask will soothe and ease your skin. Specially formulated for those who cannot tolerate normal cosmetics, our Desensitizing Mask soothes reactive skin in a refreshing moisture bath. Dermatologically tested. The SOS anti-age treatment for sensitive skin.